I just finished my first trip through Slovenia, and I have to say: I am impressed. Seriously. For a country so small, Slovenia has a lot to offer, and I can’t wait to go back to explore it more in the spring or summer when it’s a bit easier to get to some of the other sights! So, here are five of my favorite things I did when I was in the lovely country of Slovenia. When people say a color is the new black, they’re always lying. But when I heard someone say once that Ljubljana is the new Vienna, I was intrigued to see whether that held water. 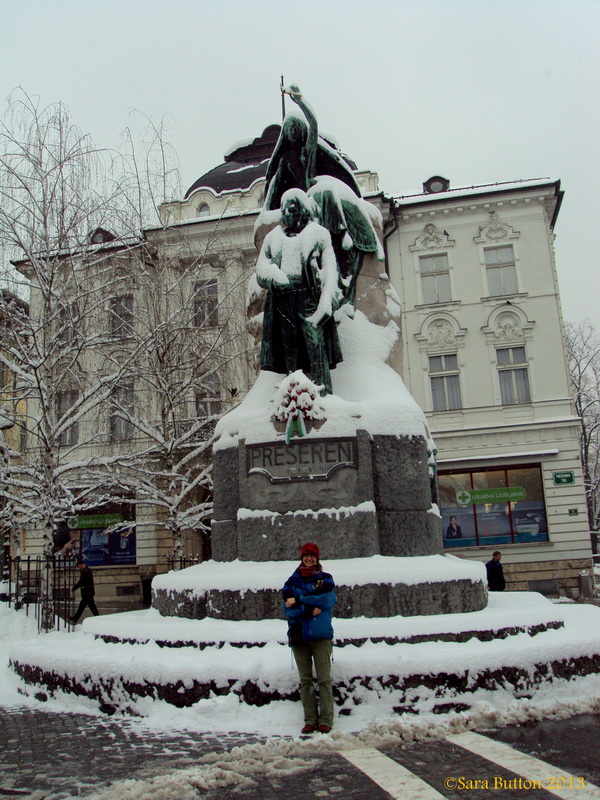 This was the Slovenian poet who penned their national anthem. This square is where everyone meets up! It does. It has the same architectural charm, the same winding streets, the same cafe culture. But Ljubljana has its own distinct personality, and because it’s still so undiscovered by many tourists, it’s a total hidden gem. I loved walking along the river, admiring all the funky and chic cafes, and wishing I could spend more time there! How many times have I been to Europe and I’m still wowed by castles? You’d think I’d get used to them at some point. But no. While in Slovenia, I visited three different castles and was excited about each of them. Watching the sunset from Ljubljana Castle was absolutely stunning, and there is a nice walk up to the castle. Skip the funicular. 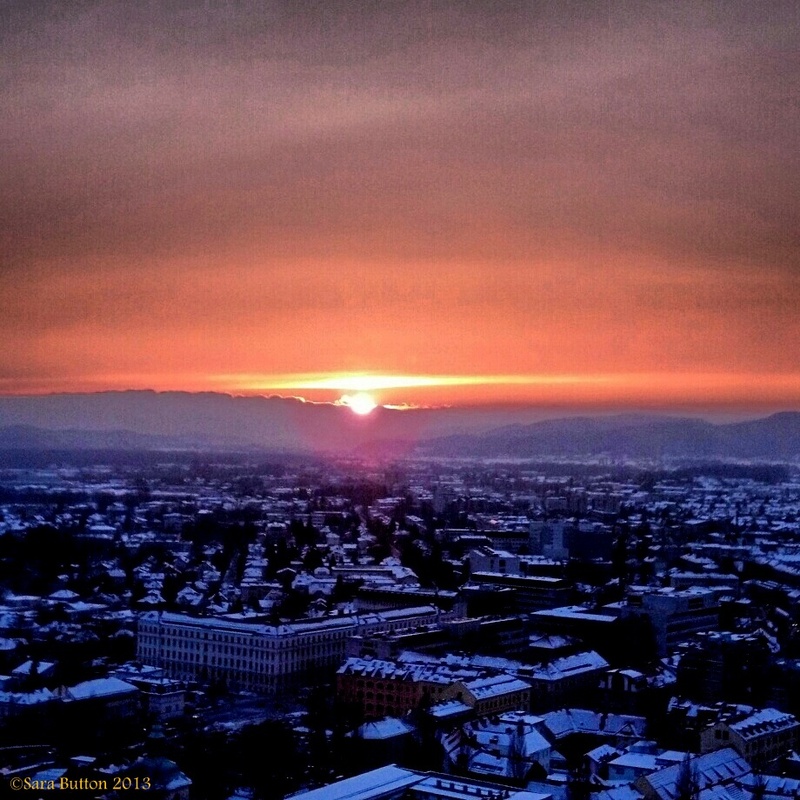 This photo was taken with my phone after a snowy day in Ljubljana. Not too shabby, Slovenia. Not too shabby. Celje Castle is on the train ride from Ptuj to Ljubljana. Not many people stop in Celje, but the fortress is big and has a phenomenal view of the city and mountains from Frederick’s Tower. The story goes that Frederick fell in love with a lassie his dad didn’t approve of; she was offed by his padre and he was imprisoned in the tower, giving it its name. 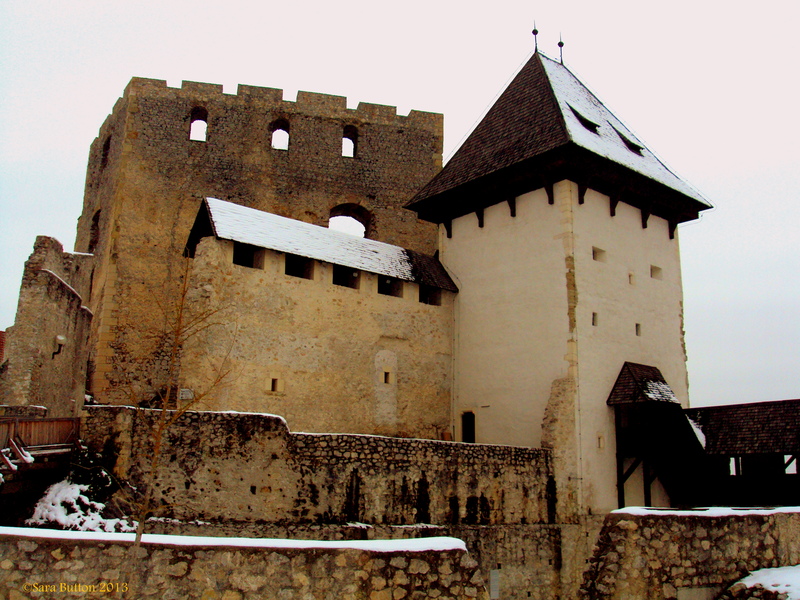 Part of the fortress at Celje Castle. When I asked what food I had to try, a number of Slovenians told me to eat krofi. When I found out they were DONUTS, I was pretty pleased, considering my absolute love for any and all kind of donut. Many cultures have wintery, hot spiced wine, but nothing I’ve had so far compares to what I drank in Slovenia. Red AND white hot wine! And I’m not sure if it was made from a certain type of sweet grape or if it was spiced a certain way, but in any case, it was darn tastay. The short history is this: once the Fourth of July Military Barracks, this compound was to be torn down in the early 1990s. To preserve it, 200 activists began squatting in it and it has since become a hub for art, alternative culture and nightlife in Ljubljana. It’s located right by a number of Ljubljana’s museums, and itself is a testament to human creativity and innovation. 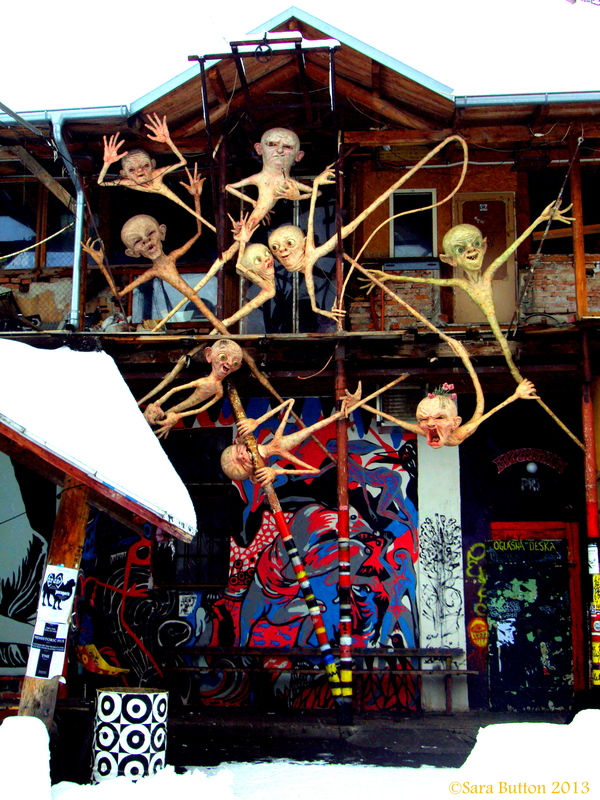 This is one of the many brilliant and evolving pieces of structural art at Metelkova Mesto. It really is a place that you just have to see to believe! Although I was there during a chilly winter day, it was clear to me how cool it would be to have a drink at one of the clubs there, or attend a lecture, or just hang out and talk to the creative minds who have preserved the place. This event will get its own post (or posts), fear not. 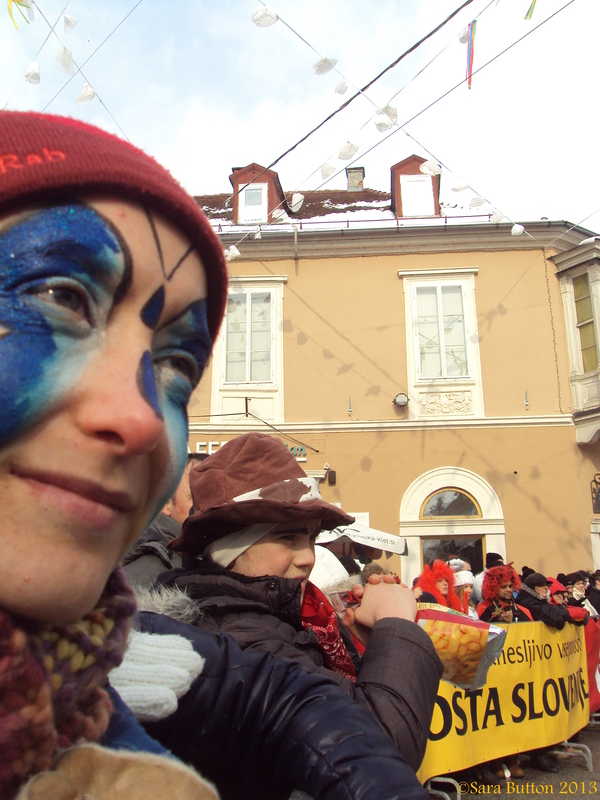 But basically kurentovanje is Slovenia’s traditional carnival. What’s cool about it is the absolutely unique masks that are part of their parade and festivities. 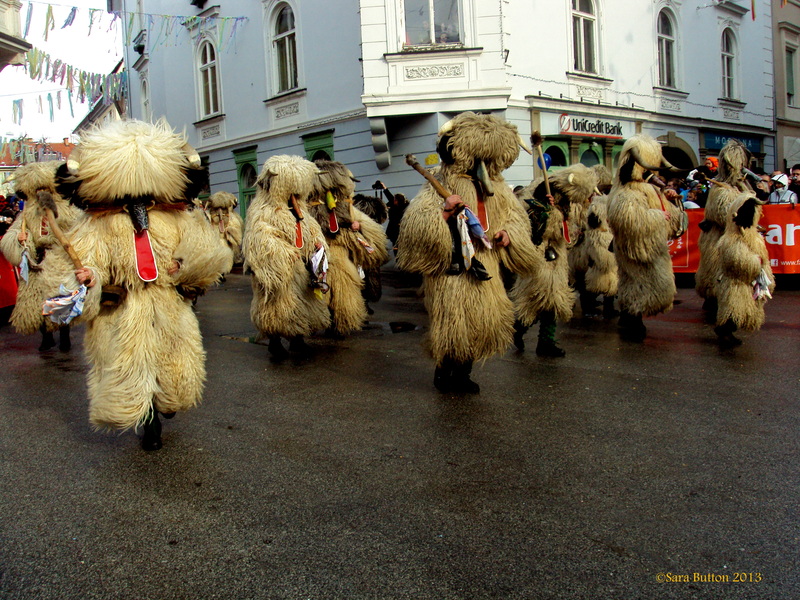 The kurent, the main figure of the celebration, wears a full body-length sheep’s wool outfits individually designed and decorated with horns or feathers, a belt of clanging bells, and wields a stick with hedgehog skin around it. His job is to scare away winter to welcome spring. Whoa! One of the hundreds of photos I took during kurentovanje. These are the title figures, the kurents. My other favorite masks are the crackers: their job is to announce the coming of the kurents, and they have got some serious whip skillz. The Saturday I arrived, I also managed to get a free lunch and some free hot wine (score!) at some event that I wasn’t clear about, but it seemed to be part of the general festivities and involved a lot of people wearing medieval garb and hanging out/eating/drinking/being merry. I got my face painted for carnival! Overall, experiencing Kurentovanje has been one of the most memorable things I’ve done this whole trip! I can’t wait to tell you all more about it! There you have it: my favorite five for Slovenia. I truly think this country is undeservedly overlooked by tourists, and although part of me wants to keep it to myself, another part knows that it’s important to share the love! Gorgeous country – my favourite too. If you’ve not been to the Gorenjska region in the north west of Slovenia, you must go back there. Places like Bled, Bohinj and Soca Valley are not far off being wonders of the world! How are costs of visiting Slovenia as compared to other destinations in your travels? A post having to do with that would be interesting. Good point! I found Slovenia to be quite affordable despite its presence on the euro. In the next post I write about it I’ll be sure to include that.